THANK YOU for considering a gift to help support the Neuro Vitality Center. You will making a difference in the lives of our patients, their caregivers and their families. Moreover, you and your family can benefit personally from making a gift to us. You are probably familiar with outright gifts – such as cash or a check, which you make today and we can use right away, as we are a 501(c)(3) nonprofit organization – Tax ID 95-3402464 – you receive income tax benefits. However, perhaps an immediate gift is not the best option for you, especially if you feel unsure about giving up assets today that you and your loved ones might need in future. If that is the case, a planned future gift may be a better option for you. There are many types of planned gifts and each offers distinctive advantages. Moreover, many planned gifts are revocable so that you have the flexibility to reshape the plan or defer the tax benefits. Alternatively, if you choose an irrevocable option – just like an outright gift – you can benefit from an immediate income tax deduction. You can choose to part with an asset today, but defer the actual giving of the asset to us, often until after your lifetime and that of a surviving beneficiary. Until then, you and your family continue to enjoy the benefits of the asset for your lifetimes. Perhaps the simplest gift is that of a bequest to the Neuro Vitality Center in your last will and testament. Join the number of donors who have become charter members of the Angel Society. We offer recognition in our publications or you may wish to remain anonymous – either way, you be reassured that your bequest will be devoted to supporting future patient care at Neuro Vitality Center. 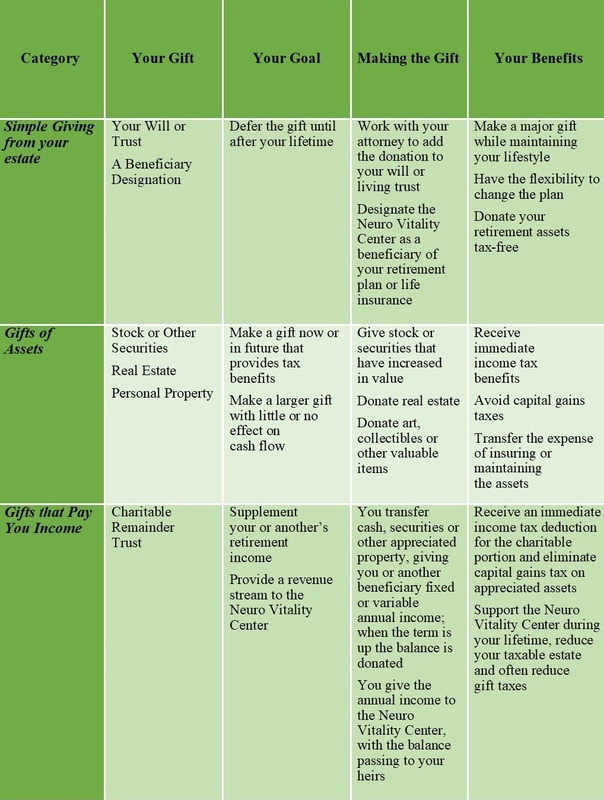 In the following chart, we summarize the benefits to you of three common types of planned charitable gifts. We would be delighted to discuss options with you, your attorney and/or your financial advisors – to help find ways for you to support our mission while protecting your family’s financial security and maximizing tax benefits, both short and long term.